If this overview of the process of RCIA seems a bit daunting to you, do not be afraid! The process is not done alone. Several inquirers will also be with you on the journey and our parish has a team of dedicated people to assist you on the journey. San Juan Del Rio Catholic Church also assigns each inquirer a sponsor who will share the journey with you and become a companion at the weekly sessions as well as at other special occasions. Of equal importance will be the prayers and support of the entire parish community. 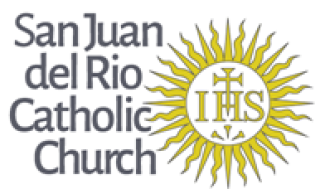 Men and women, high school age and upward, desiring to join the Catholic Church are welcome to participate in the San Juan Del Rio RCIA program. RCIA classes conducted from mid-September to Pentecost Sunday. Classes meet in the SJDR School on Sundays (except Holidays) from 9:30am to 11:00am. There is no fee for the RCIA program. Class materials are provided. Instruction focuses on the history and structure of the Church, Scripture, the Mass, the sacraments, personal and group prayer, and some basic theology of the Catholic faith, as taught in the Catechism of the Catholic Church. Catholics desiring to learn more about their faith are always welcome to join us. If you want to participate as a new catechumen, please fill out the form below.